The first T20I match was played between New Zealand and Australia on February 17, 2005. Since then the format has gained so much popularity that the ICC World T20 began in 2007. 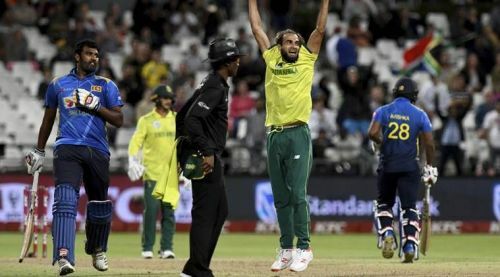 The first T20I match played between Sri Lanka and South Africa at Newlands, Cape Town on Wednesday was the 12th instance when a T20I match ended in a tie. It was an absolutely thrilling match as the hosts South Africa defeated Sri Lanka by nine runs in a super over. South Africa captain Faf du Plessis won the toss and decided to field first. A disciplined bowling effort by the hosts helped them to restrict Sri Lanka to just 134 for eight. In reply, South Africa was in control before they lost wickets at the end and almost lost the match. With two runs needed off one ball, Imran Tahir got a run and match ended in a tie. In the super over, David Miller and Rassie van der Dussen scored 14 runs off Lasith Malinga’s bowling. Defending 15 runs, Imran Tahir gave away just five runs to help the hosts win the match by nine runs. The first ever tied match in the shortest format of cricket was between New Zealand and West Indies on February 16, 2006 at Eden Park, Auckland. Both teams scored 126 before hosts New Zealand won the match with a bowl-out. India and Pakistan played second ever tied match during the World T20 in 2007 at Durban on September 14. Both teams scored 141 runs and India won the match via bowl out. In 2008, Canada and Zimbabwe were involved in a tied match at King City. Both teams made 135 each and Zimbabwe won the match in a bowl-out. West Indies and New Zealand played a thrilling tie at Auckland on 26th December 2008. From then onwards, the tied matches were decided in a super over. West Indies won that super over. Australia and New Zealand were involved in a high scoring thriller at Christchurch on February 28, 2010. New Zealand scored 214 for four and then in the chase, Australia made 214 for six. New Zealand won the super over. Australia was again involved in a tied match against Pakistan in 2012 at Dubai on September 7, 2012. Both teams scored 151 each before Pakistan won the super over. In September 2012, Sri Lanka and New Zealand played a tied match at Pallekele with both teams scoring 174. Sri Lanka won the super over. In October 2012, West Indies and New Zealand were involved in a low scoring thriller. Both teams made 139 each before West Indies won the match in super over. England versus Pakistan played at Sharjah on November 30, 2015 and saw another tied match in the T20I format. England won the match in super over. On June 17, 2018, Scotland and Ireland T20I match played at Deventer saw the match tied. Both teams scored 185 each as there was no super over. On January 22, 2019, Qatar and Kuwait were involved in a tied match. Both teams scored 155 each as Qatar won the match via super over.